TexWrite® self-adhesive sticky notes, TexNotes, are the best way to add notes to documents, reports, equipment and work surfaces with reduced risk of cleanroom environment contamination. 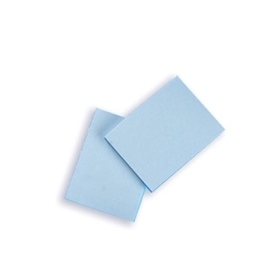 The handy TexWrite® sticky note sheets feature a proprietary adhesive strip. This low-contamination, polymeric adhesive allows TexNotes to be attached and removed without leaving the high residue associated with most adhesives. The TexWrite® TexNotes substrate ensures low particle generation and low ionic contamination. TexNotes are cleanroom-packaged in 72-sheet pads and are double-bagged.